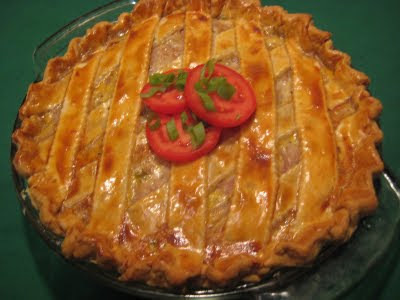 Ok, ok, I know there must be one or two of you out there who are krinkling your noses at the thought of an onion pie, and to both of you I say lets talk about this for a minute! For years I've said that everything I cook starts with cutting an onion. It's true! It's one of the most important ingredients in all of cookdom! Just like garlic or carrots or celery or green bell peppers, it's one of the key aromatics that is used as a foundation on which to build flavors in sauces, soups, stews, and casseroles, etc. So, I figured, wouldn't it be nice to take this supporting player, this back-up singer, if you will, and bring it out into the limelight? We're talking front and center, with a big fat spot light on it, fit for a headliner! Well, this pie does exactly that! In a large heavy pot with a lid, melt the butter over medium heat. Slice off both ends of each onion, then slice in half, pole to pole. Now place them center cut side down, and thinly slice across the grain, giving you thin half rings. After thinly slicing all of the onions, add them to the pot. Cover. Let it cook for about 5 minutes. Remove cover and give it a good stir. At this point, you'll be saying "How in hell am I ever going to fit all these onions into one pie?" But trust me, they'll cook down quite a bit, and there's no need to swear. Once the onions have softened, add the garlic, thyme, and salt and pepper. Continue to cook and stir the onions until they become golden in color. As they start to caramelize, be sure to scrape up the fond from the bottom of the pot. This will take a good 20 minutes or even longer. Be patient! When most of the liquid has evaporated, remove from heat. In a large bowl, beat the egg with the flour and cream until smooth. Add the caramelized onion mixture and stir well. Place bottom crust in a Pyrex pie plate, making sure to leave some hanging over the edge. Pour in the onion mixture and smooth to an even layer. Place top crust over pie. Trim excess. Crimp the two crusts together, and flute to make a decorative edge. Cut slits in the top of the pie so that steam will be able to escape. Bake in oven 20 minutes. Reduce heat to 375F and bake 20-30 minutes more, or until golden and set. Let it cool slightly before serving with a simple green salad or slices of fresh tomatoes. Definitely use a sweet variety of onion for this recipe. I've tried it with red or white onions and it just wasn't the same. Quick tip- When buying onions, the sweeter varieties are the ones that look like they've been squashed from pole to pole. They look like they started out round, but someone smashed them, giving them a sort of flatter shape, know what I mean? For a more decorative touch, you can weave a lattice top for your top crust, or just lay half your strips of pastry in one direction, then go back and lay the other half across the first half, as pictured above. To make a shiny golden crust, simply brush the top crust with an egg wash, which is an egg beaten with a splash of water or milk or cream.